What is a PBG? 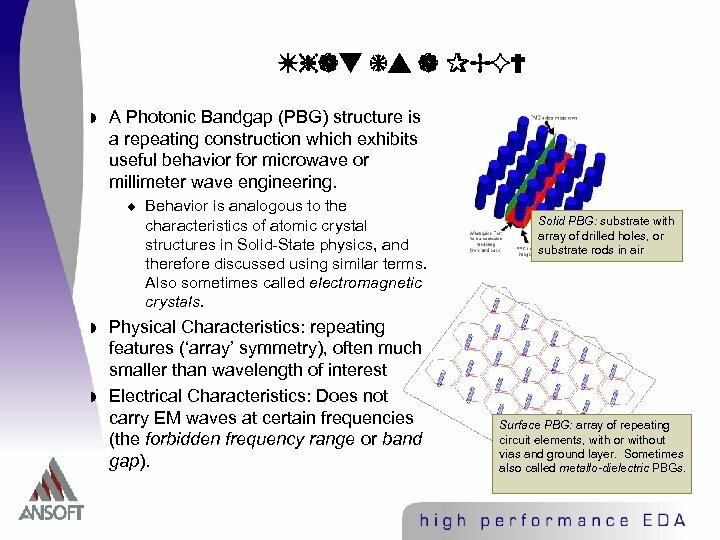 w A Photonic Bandgap (PBG) structure is a repeating construction which exhibits useful behavior for microwave or millimeter wave engineering. 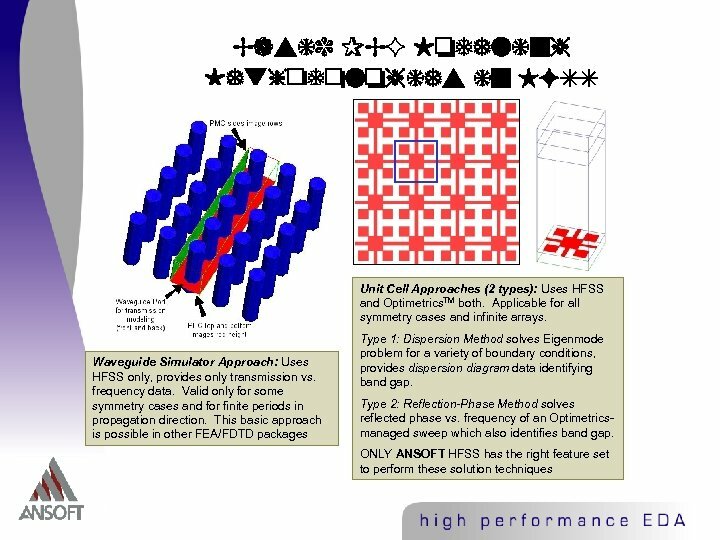 u w w Behavior is analogous to the characteristics of atomic crystal structures in Solid-State physics, and therefore discussed using similar terms. Also sometimes called electromagnetic crystals. 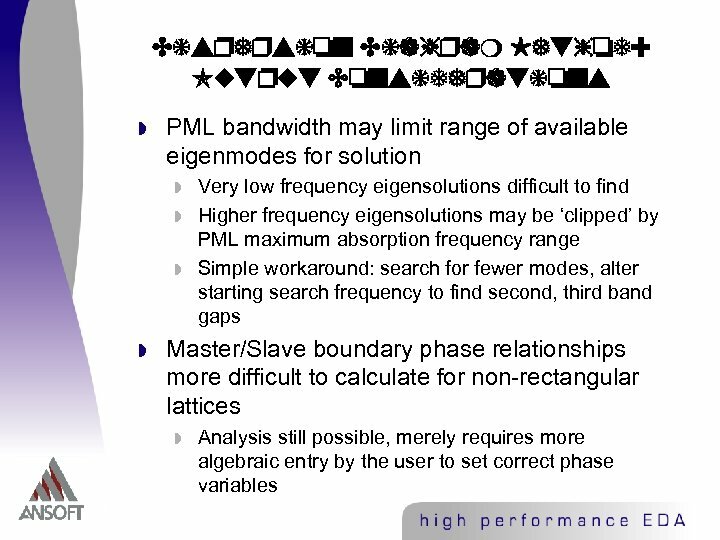 Physical Characteristics: repeating features (‘array’ symmetry), often much smaller than wavelength of interest Electrical Characteristics: Does not carry EM waves at certain frequencies (the forbidden frequency range or band gap). 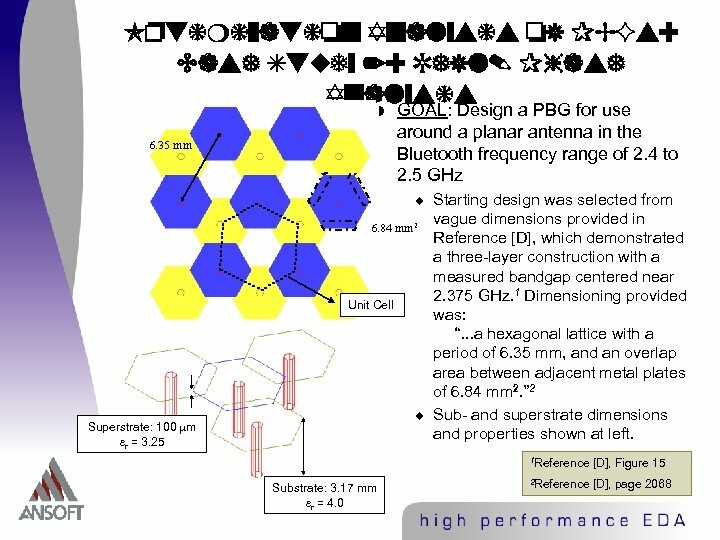 Solid PBG: substrate with array of drilled holes, or substrate rods in air Surface PBG: array of repeating circuit elements, with or without vias and ground layer. 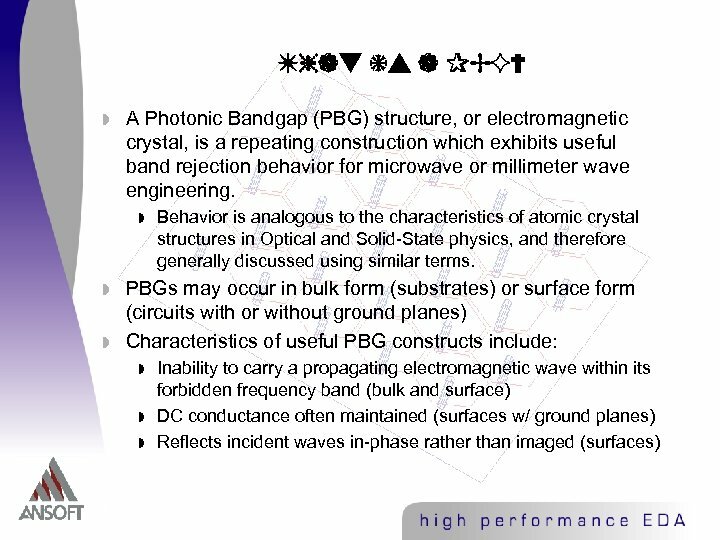 Sometimes also called metallo-dielectric PBGs. 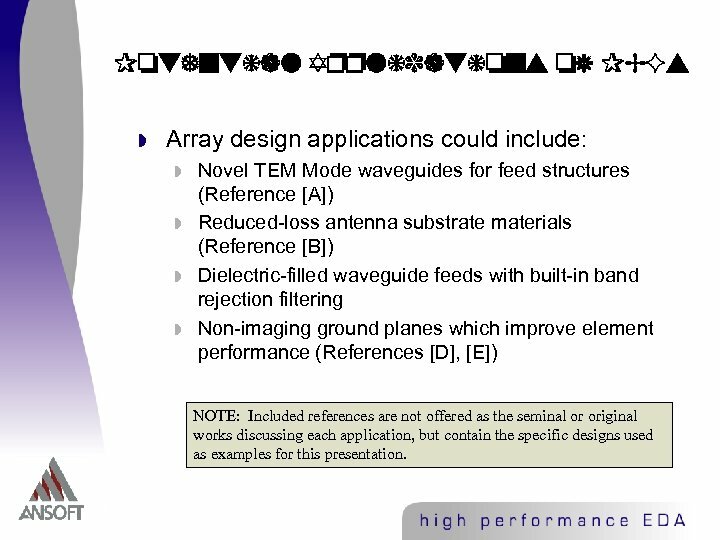 Potential Applications of PBGs w Array design applications could include: w w Novel TEM Mode waveguides for feed structures (Reference [A]) Reduced-loss antenna substrate materials (Reference [B]) Dielectric-filled waveguide feeds with built-in band rejection filtering Non-imaging ground planes which improve element performance (References [D], [E]) NOTE: Included references are not offered as the seminal or original works discussing each application, but contain the specific designs used as examples for this presentation. 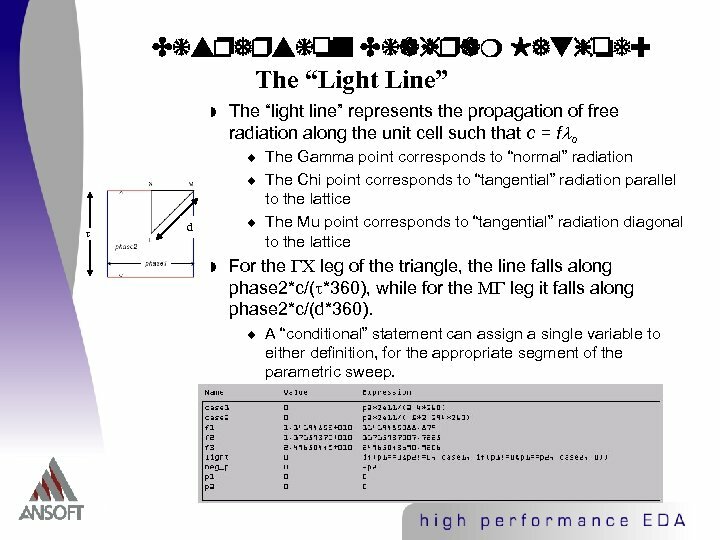 Dispersion Diagram Method: The “Light Line” w The “light line” represents the propagation of free radiation along the unit cell such that c = f o u u u d w The Gamma point corresponds to “normal” radiation The Chi point corresponds to “tangential” radiation parallel to the lattice The Mu point corresponds to “tangential” radiation diagonal to the lattice For the leg of the triangle, the line falls along phase 2*c/( *360), while for the leg it falls along phase 2*c/(d*360). u A “conditional” statement can assign a single variable to either definition, for the appropriate segment of the parametric sweep. 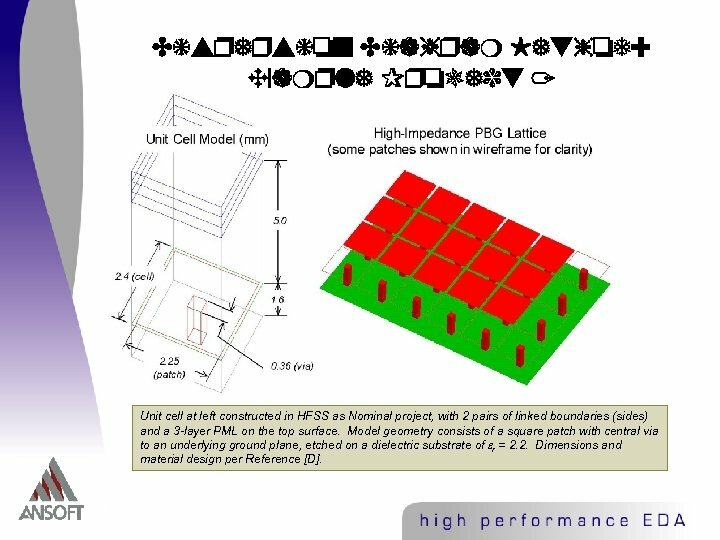 Dispersion Diagram Method: Example Project 1 Unit cell at left constructed in HFSS as Nominal project, with 2 pairs of linked boundaries (sides) and a 3 -layer PML on the top surface. Model geometry consists of a square patch with central via to an underlying ground plane, etched on a dielectric substrate of r = 2. 2. Dimensions and material design per Reference [D]. 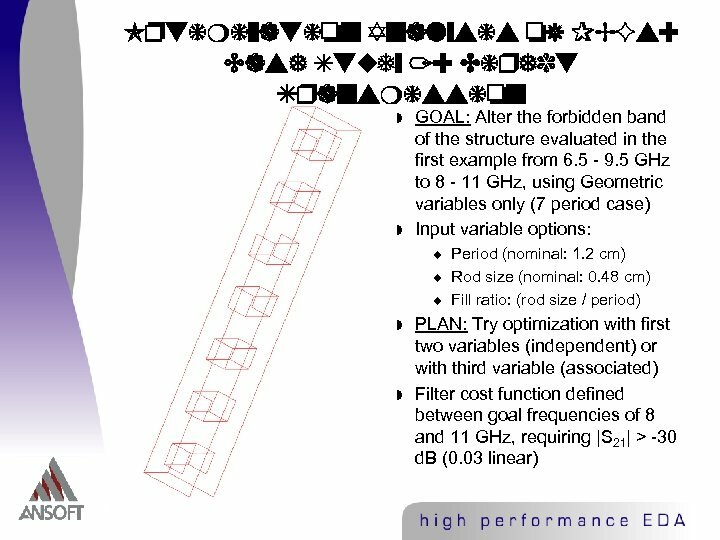 Dispersion Diagram Method: Example 1 Results show forbidden band of approximately 10 - 15 GHz, which agrees closely with those published in Reference [D], Figure 10, from a non-commercial solver. Solution was obtained on a Pentium III (laptop), 450 MHz, 256 MB RAM, in 4 hrs 7 minutes, to 0. 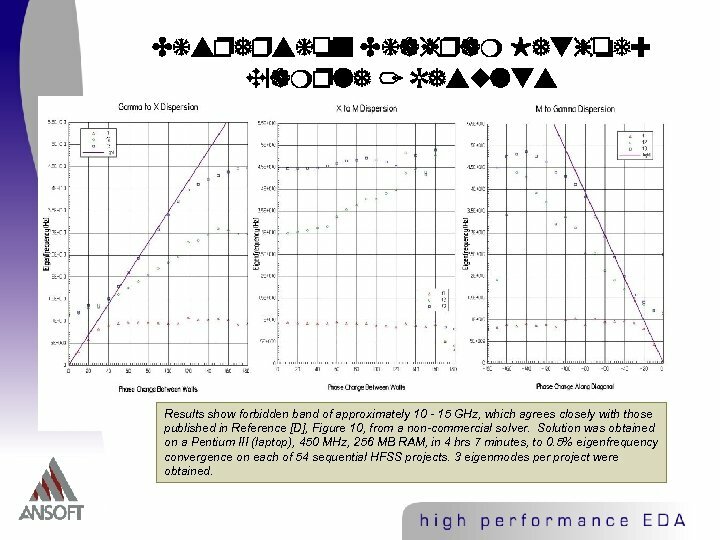 5% eigenfrequency convergence on each of 54 sequential HFSS projects. 3 eigenmodes per project were obtained. 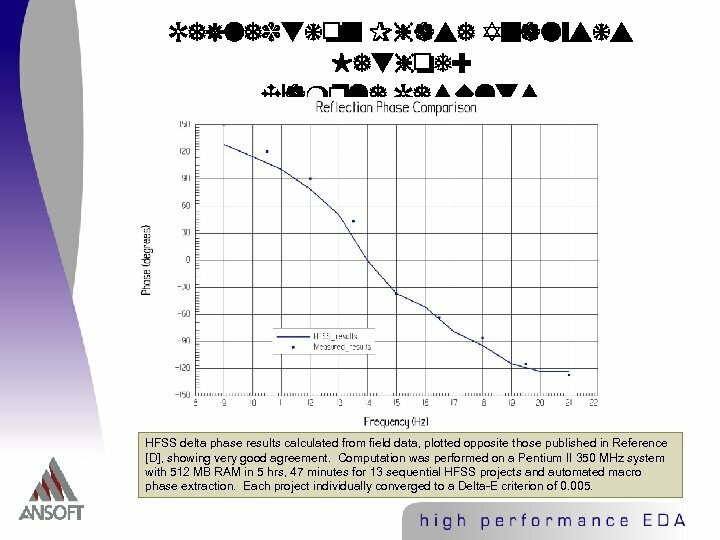 Dispersion Diagram Method: Example Project 2 100 40 (mils) 120 27. 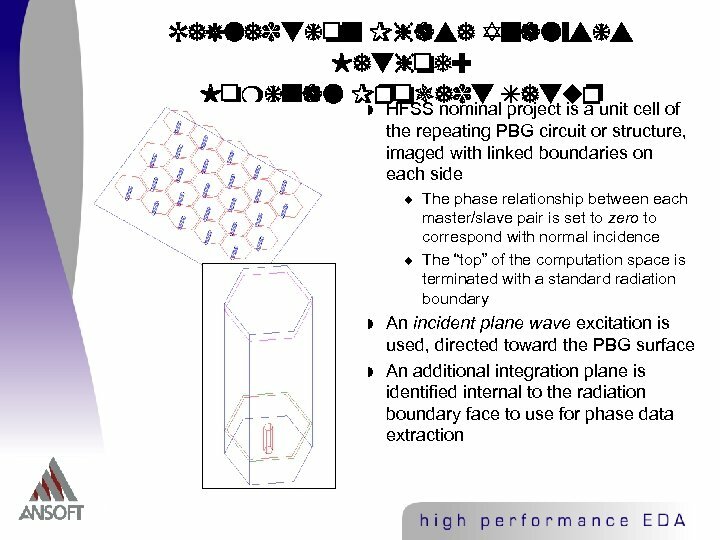 5 10 Unit cell UC-PBG at left constructed in HFSS as Nominal project, with 2 pairs of linked boundaries (sides) and a 2 -layer PML on the top surface. Model geometry consists of a planar metal circuit above an underlying ground plane, etched on a dielectric substrate of r = 10. 2 and height 25 mils. 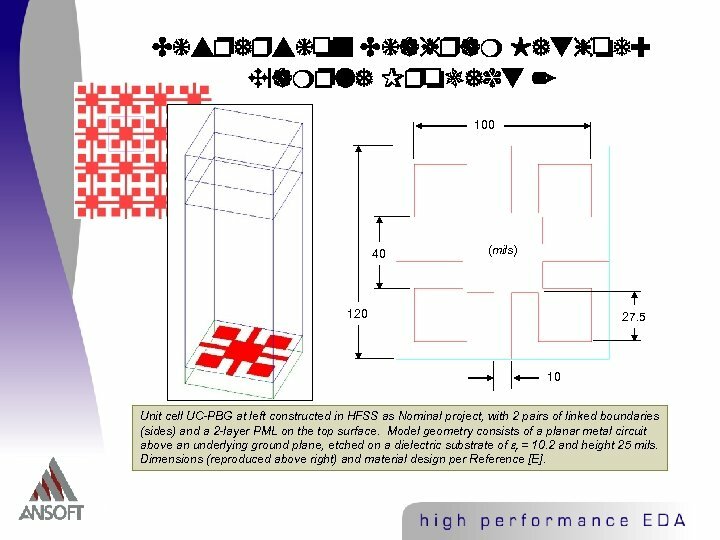 Dimensions (reproduced above right) and material design per Reference [E]. 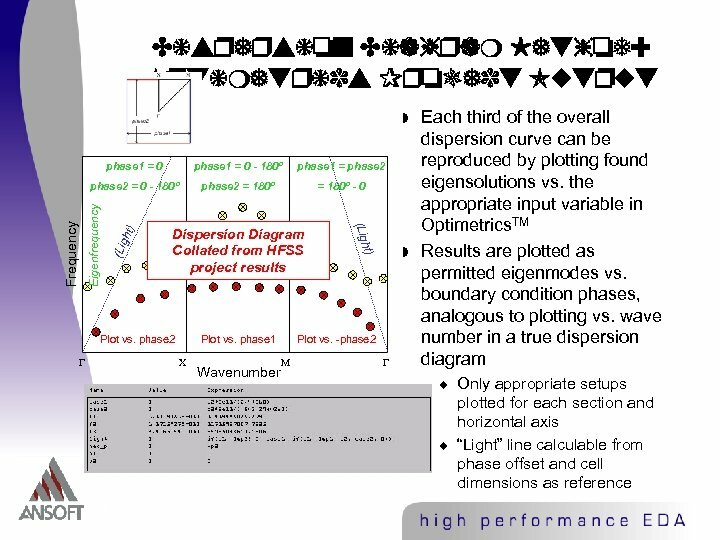 Dispersion Diagram Method: Example 2 Results illustrating forbidden band at approximately 11. 9 - 13. 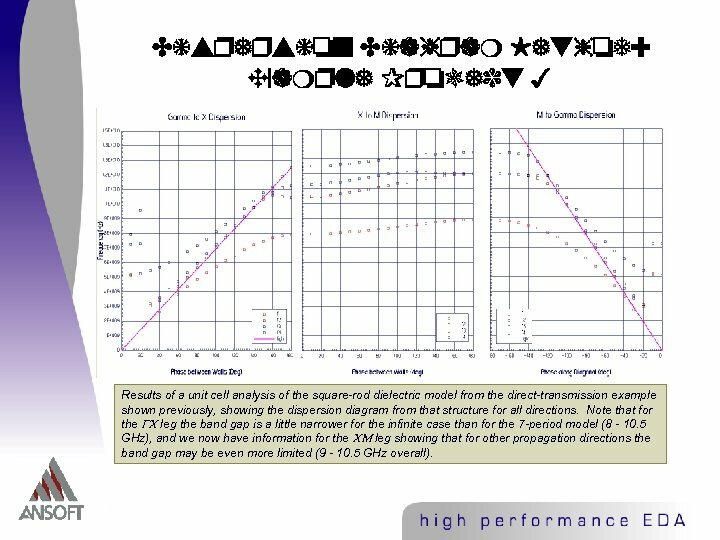 8 GHz, which corresponds reasonably with the results published in Reference [E]. 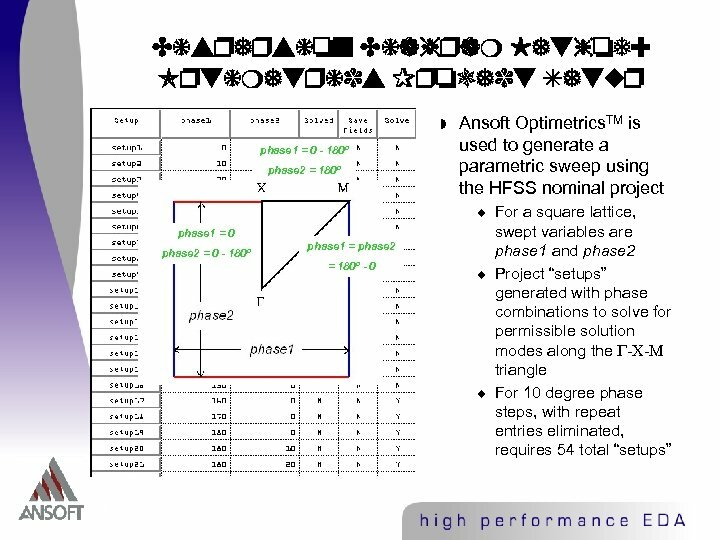 Solution was performed on a Pentium III (laptop) 450 MHz system, 256 MB RAM, in 10 hrs 17 minutes to 1% eigenfrequency convergence on each of 54 sequential HFSS projects. 5 eigenmodes per project were obtained. 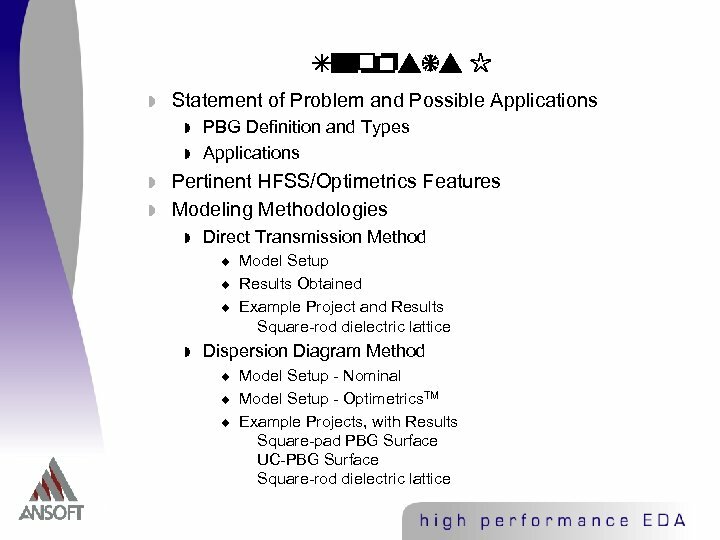 Dispersion Diagram Method: Example Project 3 Results of a unit cell analysis of the square-rod dielectric model from the direct-transmission example shown previously, showing the dispersion diagram from that structure for all directions. Note that for the leg the band gap is a little narrower for the infinite case than for the 7 -period model (8 - 10. 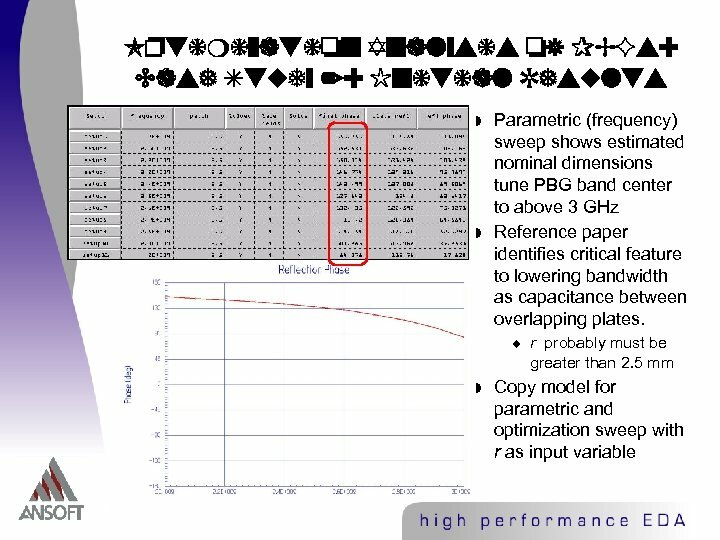 5 GHz), and we now have information for the leg showing that for other propagation directions the band gap may be even more limited (9 - 10. 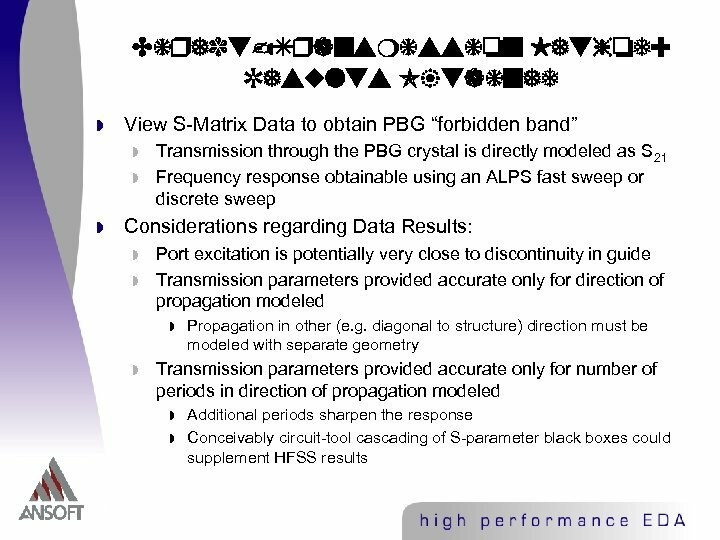 5 GHz overall). 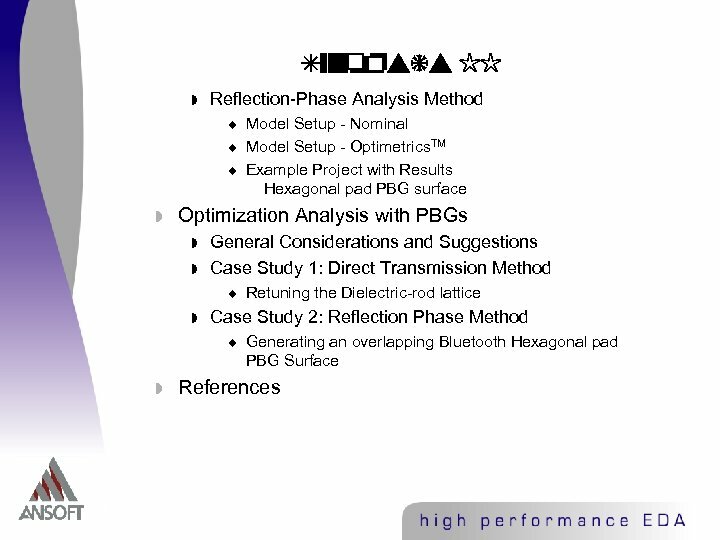 Dispersion Diagram Method: Notes for Consideration w Entire dispersion plot may not be necessary w w w Square-grid dielectric only structures will have gap top and bottom defined by either the , , or points on the Brillioun triangle Other lattices and/or metallo-dielectric structures cannot be reduced to only 3 points Since band-gap information is ‘spread’ over multiple individual HFSS setups, optimization via this technique may be tricky w w The gap-defining phase conditions may be different for different geometries, preventing selection of a single phase combination as your optimization ‘nominal’ So how do you define a single project which will permit centering of a bandgap? . . . 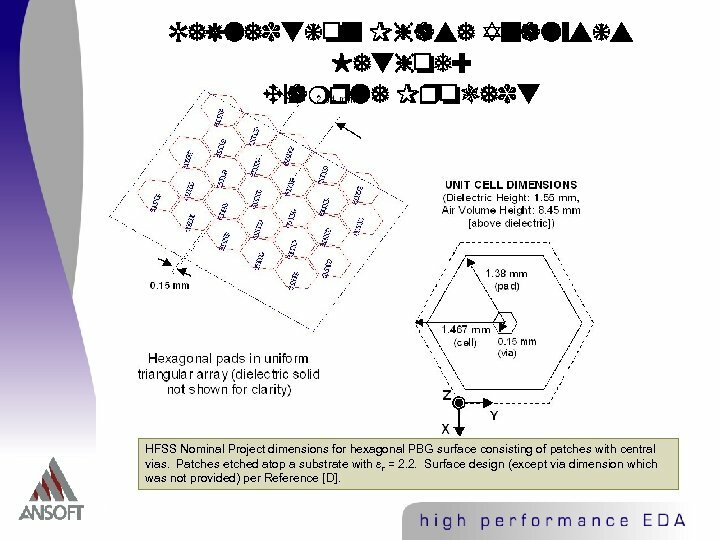 Reflection Phase Analysis Method: Example Project HFSS Nominal Project dimensions for hexagonal PBG surface consisting of patches with central vias. 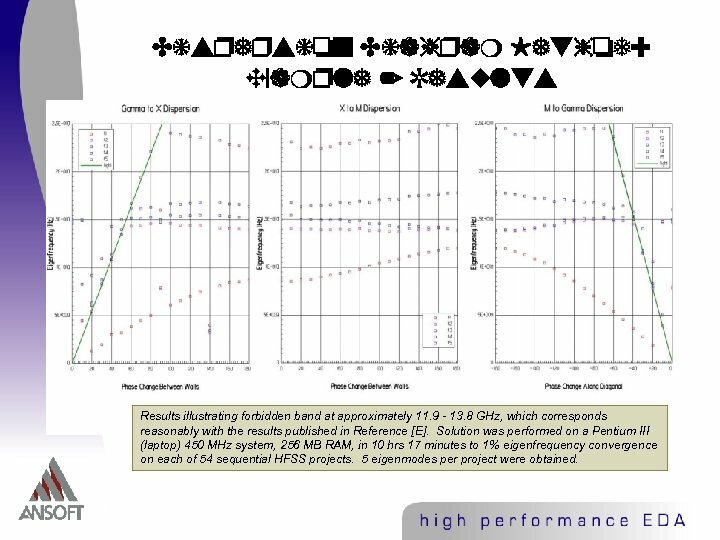 Patches etched atop a substrate with r = 2. 2. 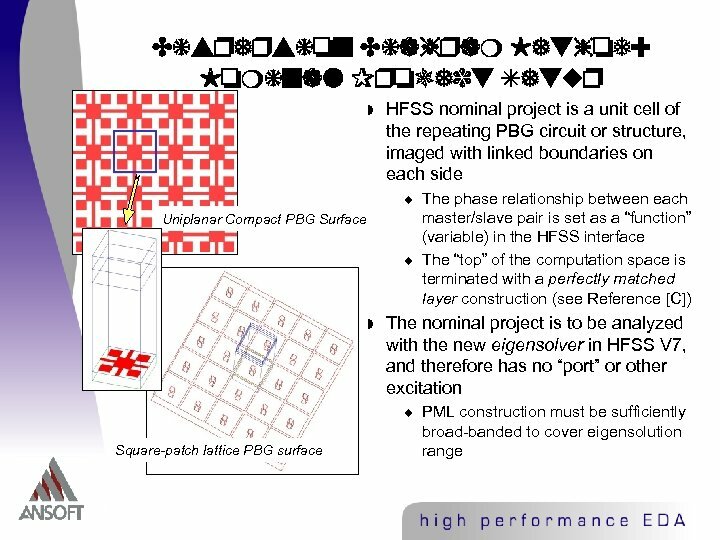 Surface design (except via dimension which was not provided) per Reference [D]. 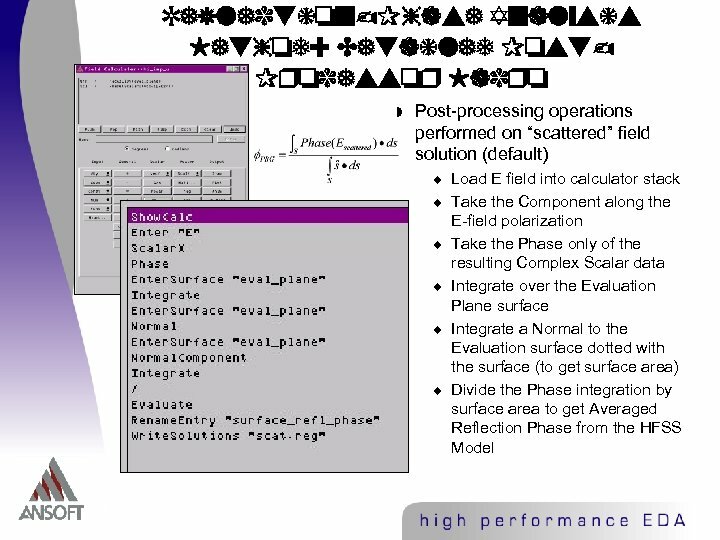 Reflection Phase Analysis Method: Example Results HFSS delta phase results calculated from field data, plotted opposite those published in Reference [D], showing very good agreement. 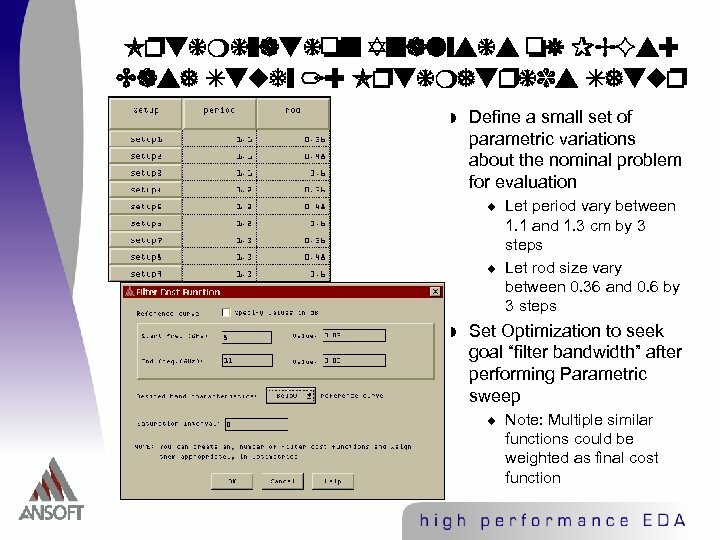 Computation was performed on a Pentium II 350 MHz system with 512 MB RAM in 5 hrs, 47 minutes for 13 sequential HFSS projects and automated macro phase extraction. 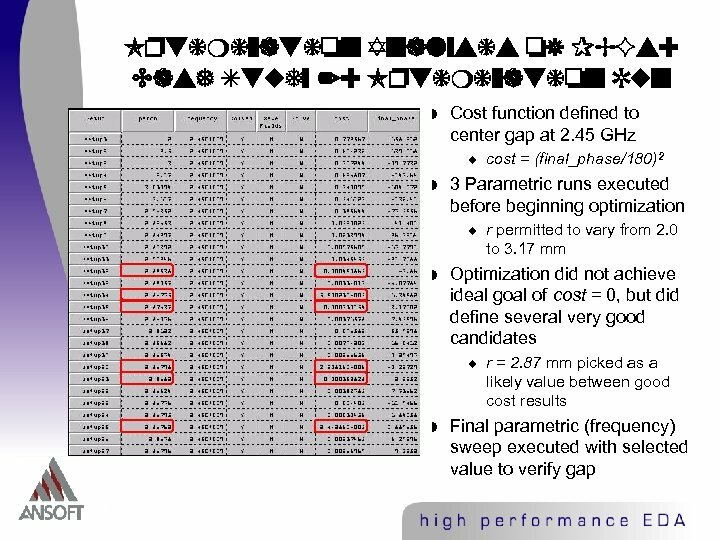 Each project individually converged to a Delta-E criterion of 0. 005. 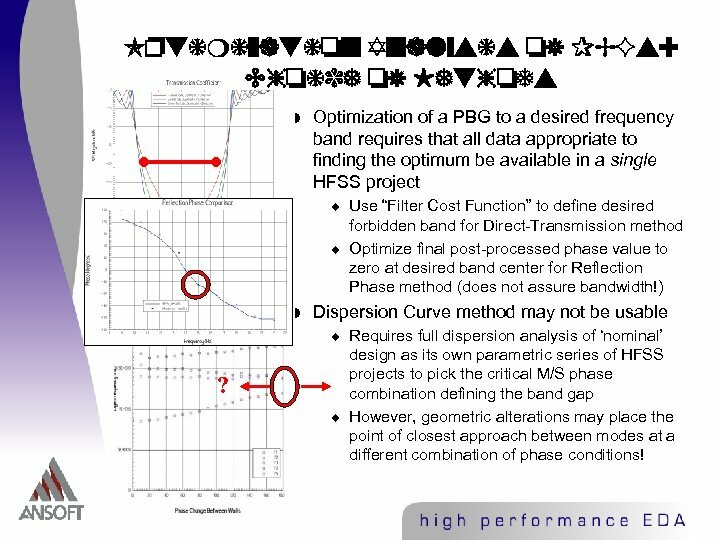 Optimization Analysis of PBGs: Choice of Methods w Optimization of a PBG to a desired frequency band requires that all data appropriate to finding the optimum be available in a single HFSS project u u w Use “Filter Cost Function” to define desired forbidden band for Direct-Transmission method Optimize final post-processed phase value to zero at desired band center for Reflection Phase method (does not assure bandwidth!) 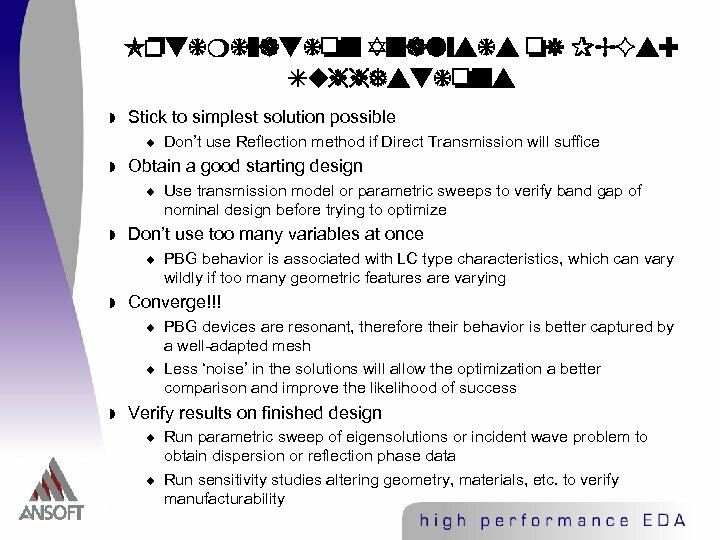 Dispersion Curve method may not be usable u ? 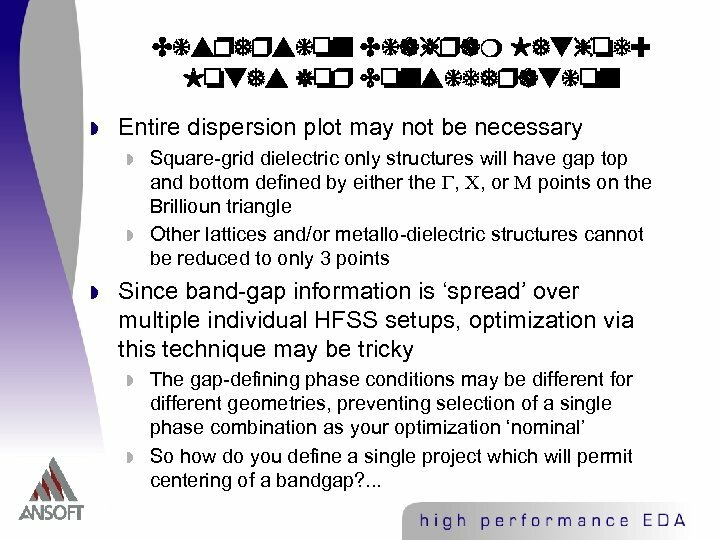 u Requires full dispersion analysis of ‘nominal’ design as its own parametric series of HFSS projects to pick the critical M/S phase combination defining the band gap However, geometric alterations may place the point of closest approach between modes at a different combination of phase conditions! 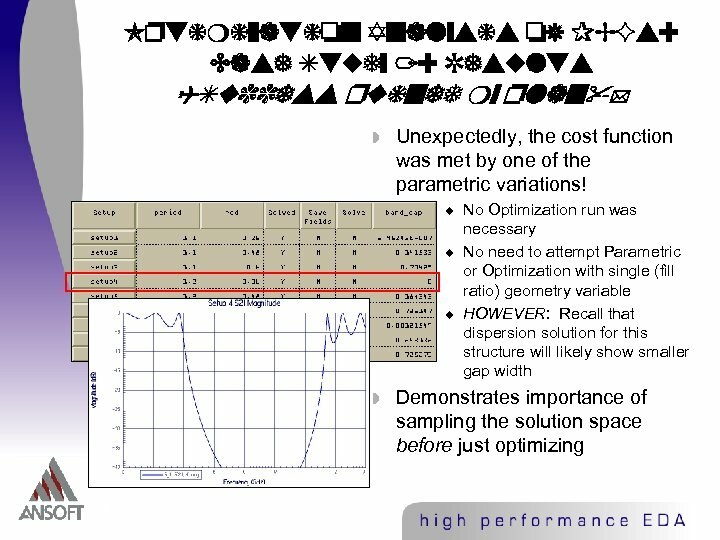 Optimization Analysis of PBGs: Case Study 2: Final Results w Parametric (frequency) sweep of r = 2. 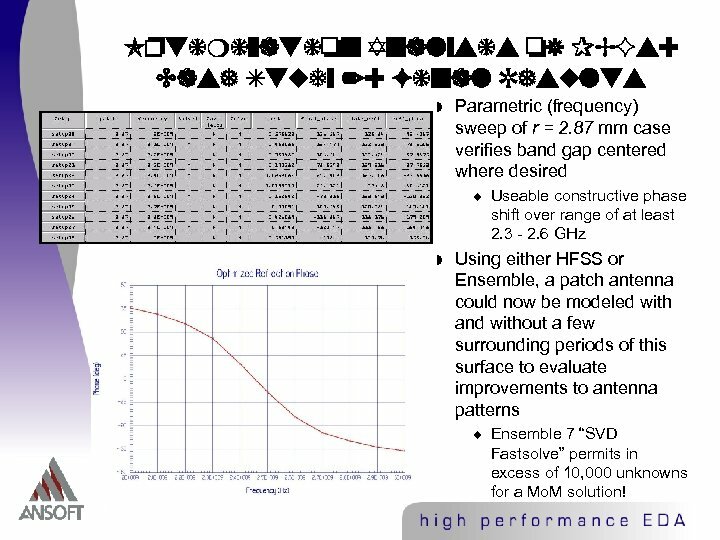 87 mm case verifies band gap centered where desired u w Useable constructive phase shift over range of at least 2. 3 - 2. 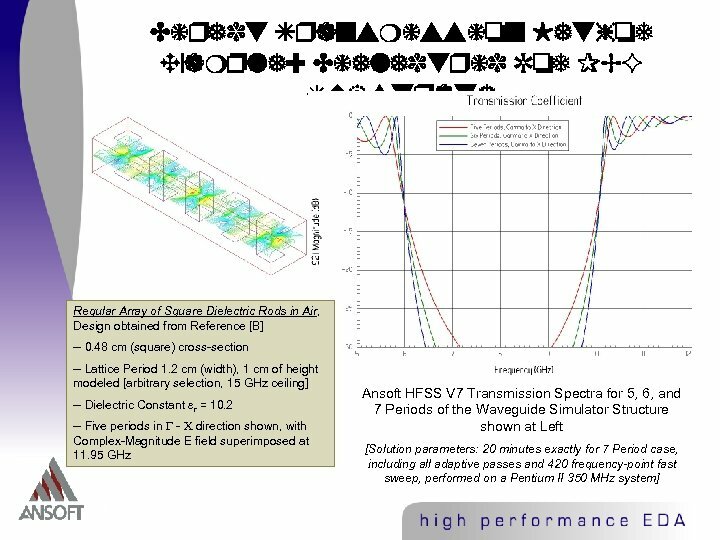 6 GHz Using either HFSS or Ensemble, a patch antenna could now be modeled with and without a few surrounding periods of this surface to evaluate improvements to antenna patterns u Ensemble 7 “SVD Fastsolve” permits in excess of 10, 000 unknowns for a Mo. M solution! 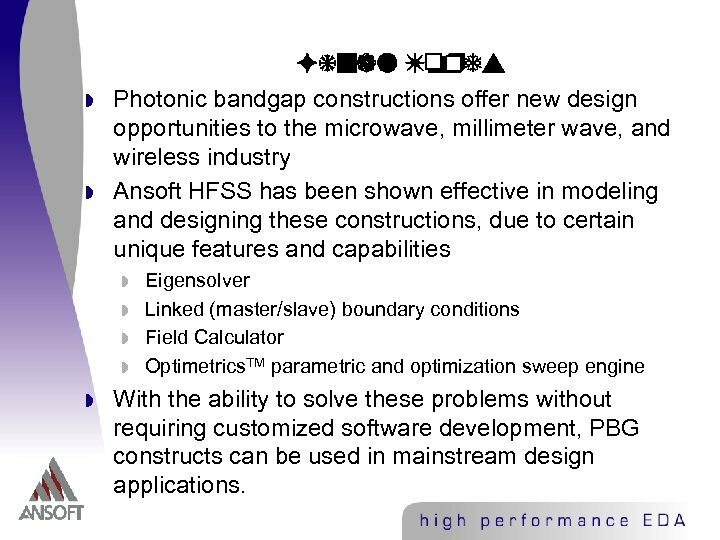 Final Words w w Photonic bandgap constructions offer new design opportunities to the microwave, millimeter wave, and wireless industry Ansoft HFSS has been shown effective in modeling and designing these constructions, due to certain unique features and capabilities w w w Eigensolver Linked (master/slave) boundary conditions Field Calculator Optimetrics. 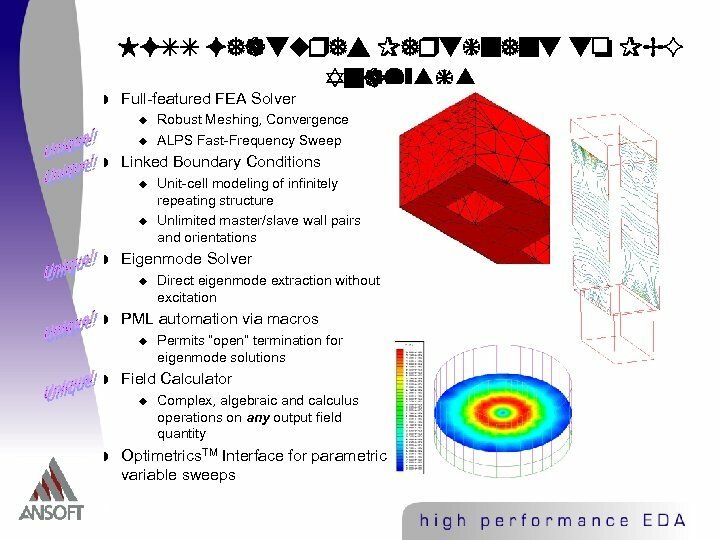 TM parametric and optimization sweep engine With the ability to solve these problems without requiring customized software development, PBG constructs can be used in mainstream design applications. 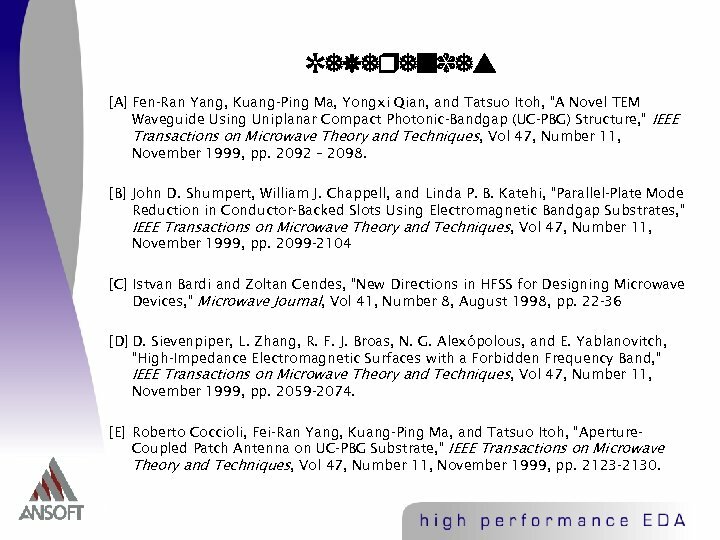 References [A] Fen-Ran Yang, Kuang-Ping Ma, Yongxi Qian, and Tatsuo Itoh, “A Novel TEM Waveguide Using Uniplanar Compact Photonic-Bandgap (UC-PBG) Structure, ” IEEE Transactions on Microwave Theory and Techniques, Vol 47, Number 11, November 1999, pp. 2092 – 2098. 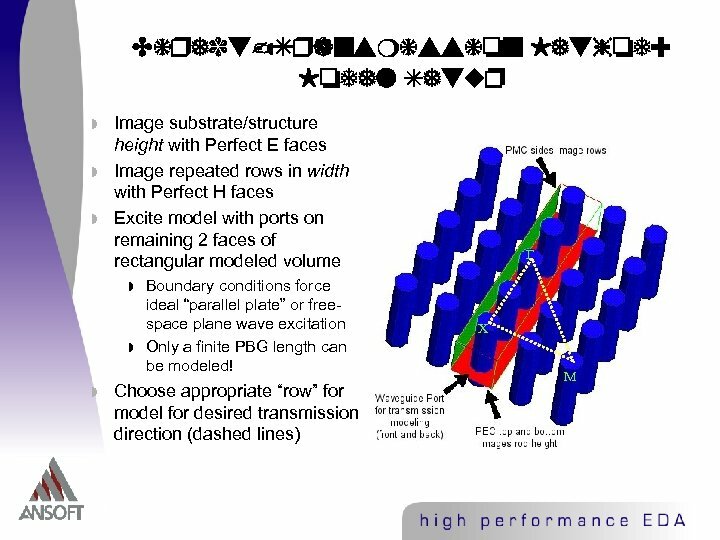 [B] John D. Shumpert, William J. Chappell, and Linda P. B. Katehi, “Parallel-Plate Mode Reduction in Conductor-Backed Slots Using Electromagnetic Bandgap Substrates, ” IEEE Transactions on Microwave Theory and Techniques, Vol 47, Number 11, November 1999, pp. 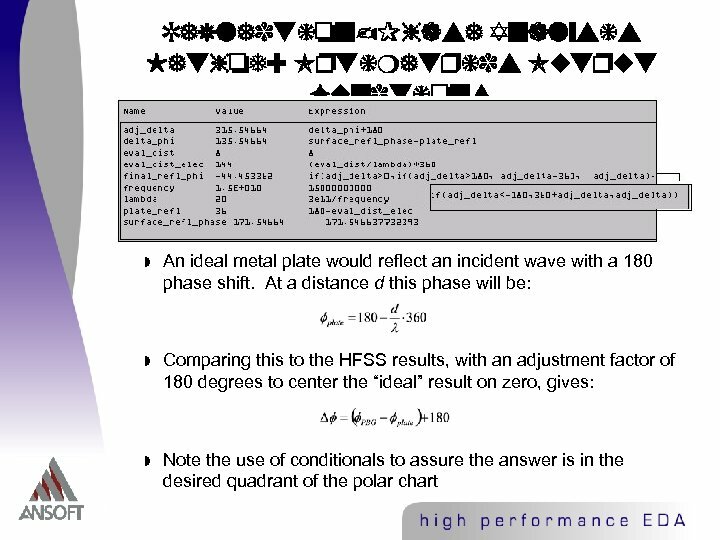 2099 -2104 [C] Istvan Bardi and Zoltan Cendes, “New Directions in HFSS for Designing Microwave Devices, ” Microwave Journal, Vol 41, Number 8, August 1998, pp. 22 -36 [D] D. Sievenpiper, L. Zhang, R. F. J. Broas, N. G. Alexópolous, and E. Yablanovitch, “High-Impedance Electromagnetic Surfaces with a Forbidden Frequency Band, ” IEEE Transactions on Microwave Theory and Techniques, Vol 47, Number 11, November 1999, pp. 2059 -2074. [E] Roberto Coccioli, Fei-Ran Yang, Kuang-Ping Ma, and Tatsuo Itoh, “Aperture. 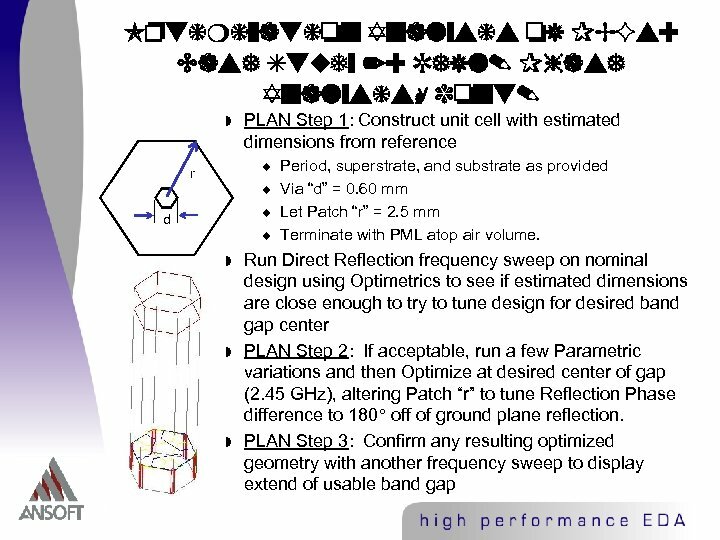 Coupled Patch Antenna on UC-PBG Substrate, ” IEEE Transactions on Microwave Theory and Techniques, Vol 47, Number 11, November 1999, pp. 2123 -2130.